The thrill of a fast hit and big fight. 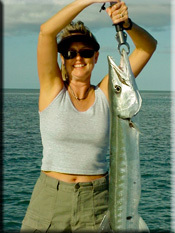 Barracuda fishing in Key West is without a doubt one of the under sung heros of fishing. Shallow water, explosive strikes and plenty of barracudas to cast to. Reaching up to 4.5 ft. in length and as much as 30lbs the great barracuda deserves respect not only as a killer but as an incredible game fish. Capable of sprinting to 40 mph in two body lengths these fish can offer bone crushing blows to unsuspecting prey. The hit is explosive and the result is sure disaster for his target. I should know, I was attacked by a barracuda in 1993 while diving off of Marathon here in the Florida Keys. Since then I have targeted these fantastic sport fish with a fever on light tackle. We offer private charters to catch the great barracuda of the South Atlantic on the flats and over the shallow wrecks. Casting plugs, fly fishing and artificial lures to get them to smash the hell out of them. Its like watching the gladiators go to battle. Anglers can mix and match. Fish for barracudas specifically for the whole trip or do a little of everything like our All In Wonder fishing charter or the Shallow Water Monsters Tour. We can fish for barracudas here in Key West on the shallows of the flats and backcountry or offshore over the wrecks and reefs just off of Key West. Rates vary depending on what kind of boat is needed. 4, 6, and 8 hour trips that offer the best in boats, tackle and equipment. We supply the artificial lures, flies, bait and fishing licenses. This is my favorite time to hit them on the flats while they sun them selves. Literally an angler and I can fish for 3 hours and have a fish on most of the time. For the Shark fishing Shallow Water Monsters trip we usually keep one or two to chum up the big sharks for even more excitement. The heat of the flats starts to push the Great Barracudas to the 2-4 ft. depths but still fun to fish for on top water or fly fishing. Tarpon fishing is usually the priority this time of the year. Shark fishing with Barracudas is also real good. Offshore is great for barracudas in the summer as they stack up on structure. They are pretty lean on the flats for sight fishing although they are still around. The Barracudas start to make their way back to the flats for the huge schools of bait fish such as mullet and white bait that makes for them an easy meal. Great time to go Shark Fishing too with Barracudas as chum.